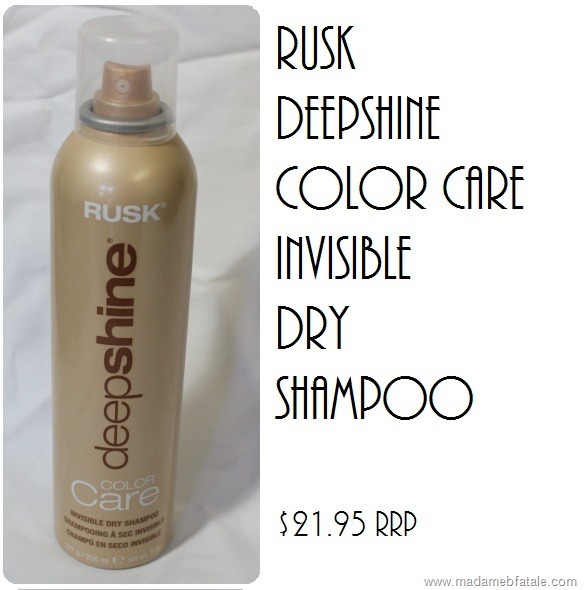 My current must have for summer dry shampoo hands down has to be the Rusk Deepshine Colour Care Dry Shampoo. The dry shampoo is only lightly scented which is a bonus for me as I find a lot of dry shampoos can be rather overpowering. Sprays out with what I can only explain as a lot of pressure, only need to spray a little at a time. Is definitely invisible, before dying my roots darker this wasn’t an issue for me but it’s been working great with no white shadow and when I use the right amount my hair doesn’t feel “dusty”, if that makes any sense. It’s Talc-free and doesn’t leave any ‘snow’ on your top. Using dry shampoo to prolong washing hair has always been one of the ways I try and help prevent hair colour fading but the Deepshine Colour Care Dry Shampoo helps that little bit more as it has UV protection in it. Retails at $21.95 and is available at Hairhouse Warehouse, Price Attack and some independent retailers nationally such as GlamaCo (QLD). Disclaimer- The Rusk Dry Shampoo was received for review consideration.